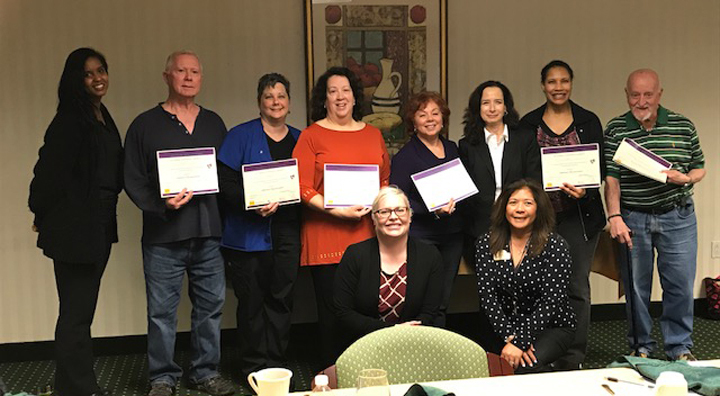 (PRINCETON, NJ) Brandywine Living at Princeton participated as a host site for the 9-week certification program titled Stress Busting Program for Family Caregivers led by The Alzheimer’s Association and sponsored by Rowan University. The Stress-Busting Program (SBP) for Family Caregivers is an evidence-based program that provides support, resources and education to individuals who are primary caregivers to family with chronic illness, Alzheimer’s disease or related dementia. The program is distributed by WellMed Charitable Foundation and developed by UT Health Science Center. “On behalf of both the Delaware Valley and Greater NJ chapters of the Alzheimer’s Association, I am grateful to have been given the chance to co-facilitate, along with Robyn Kohn, this wonderful evidence-based program. “We wouldn’t have been able to do it without the warm generosity of Brandywine Living at Princeton for their hospitality in hosting and also providing take home dinners for our members. What a treat on so many levels! “From this 9-week series, a seemingly a short time frame when compared to the Alzheimer’s journey, members spoke of the wonderful benefits that they can take with them to make their own Alzheimer’s caregiving journeys more manageable and meaningful,” said Krista McKay, MA, CDP, Director of Programs and Services for the Alzheimer’s Association, Delaware Valley Chapter. Additionally, support from other caregivers experiencing the same circumstances allowed participants to gain new perspective. “Knowing that what you’re going through is not unique to your situation and sharing ways to alleviate stress with one another,” replied an anonymous participant when asked about the most helpful part of the program. Brandywine Living at Princeton is proud to partner with the Alzheimer’s Association, Delaware Valley Chapter that provides irreplaceable support to our local community. Brandywine is actively expanding its portfolio in the Mid-Atlantic and currently has over $100 million of construction in progress (including communities in the Washington, DC area and Alexandria, VA scheduled to open in 2018). Brandywine is also under agreement for additional sites in Northern VA and Montgomery County, MD, and anticipates opening five communities in the D.C. metropolitan area. www.Brandycare.com.